New gardeners and even some veteran gardeners add far more garden fertilizer than their vegetables need. And in many cases when plants are struggling, fertilizer is not the issue. Or sometimes, garden fertilizer is the issue – too much of it. How much you should add to your vegetable garden depends on the soil’s natural fertility, the amount of organic matter in the soil, the type of fertilizer being added and the crop being grown. The only definitive way to know how much to add is by having your soil tested by a reputable lab. Garden soil test kits are also sold commercially but sometimes provide less-than-great results. A properly balanced soil results in beautiful crops, like these carrots. What nutrients affect a plant’s growth? Light, water, and nutrients are the primary factors that influence the growth and health of plants. Outdoors, that would be sunlight, rain or irrigation, and the nutrients available in the soil (and the soil’s pH, which affects the availability of nutrients). When plants are struggling or performing in a less than optimum way, the problem could be with any of these. Adding garden fertilizer will only help if a lack of nutrients is the problem. For instance, if your and not draining properly, or if your neighbor’s tree is shading your tomato patch, no amount of fertilizer on earth will remedy the situation. Only a soil test will let you know definitively if there is a nutrient problem with your garden soil. To complicate matters, . If your garden’s soil was/is heavily compacted by construction equipment, or if your home was built atop “fill” soil (common in new construction), you’ll have to first build a healthy soil structure by adding lots of organic content. Compost, untreated grass clippings and shredded leaves are the best way to build soil structure quickly and add slow release nutrients. This improves tilth (workability), encourages earthworm activity and supports biological activity, all of which in turn support healthy plant growth. Additionally, where you live will dictate what you may need to add to your garden soil. In the MidAtlantic and the Northeast U.S., and many other areas, clay is the norm – to separate the clay, and many nutrients become available. Coastal area soils are typically high in sand and very porous – nutrients are quickly lost to air and water. Here, garden soil requires the regular addition of organic matter, and close attention to nutrient levels and soluble salt buildup from frequent fertilization. High desert areas with harsh weather conditions are a whole nother matter. Each geography has unique native nutrient profiles and pH and only a soil test can give you an accurate picture of what’s missing and what isn’t. Garden fertilizers are either organic or inorganic (a.k.a. synthetic). Organic fertilizers may be derived from bat guano, chicken manure, cow manure, cottonseed meal, bone meal, or any number of other sources. are man-made. The N-P-K numbers on the bag of garden fertilizer are very important – they represent the percentage of nitrogen, potassium, and phosphorous (potash) present in the fertilizer. Nitrogen, Potassium, and Phosphorus are the core elements required for plant growth. Plants need N-P-K in sufficient quantities (relative to each other) for optimal growth. Nitrogen is required for plant growth – leaves, stems, roots, fruit; Phosphorous is needed for cell division to assist in that growth; and potassium is needed for the chemical processes a plant requires, disease resistance and starch formation. But just because a bag of garden fertilizer has a lot of one of these elements, it doesn’t mean that your garden plants will use it. In fact, plants will only take up what they require and bypass the rest. So adding fertilizer when it isn’t necessary is not only a waste of money but contributes to runoff of these chemicals into local waterways. 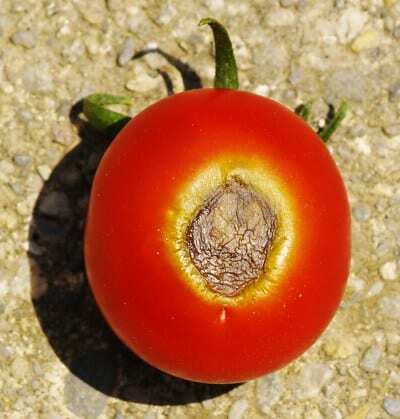 Too little calcium availability in tomatoes leads to Blossom End Rot. But these signs could also indicate other deficiencies or disease or pH problems, which may inhibit the uptake of certain nutrients. Fertilizers are marked with 3 letters: NPK, referring to the percentage by weight of nitrogen, phosphorous and potassium (potash). In many cases, N will be the largest percentage. But how much matters. High concentrations of nitrogen may “burn” certain plant roots. When too much nitrogen is added to crops such as tomatoes, the plants will be all vine and no fruit; too much to carrots and you have lots of leaves and small roots. Add too little nitrogen to corn, a heavy feeder, and ears may be underdeveloped. Too much phosphorous kills off symbiotic in soil and reduces the plant’s ability to absorb iron and other micronutrients. The only way to really know if your garden soil is deficient in nutrients is to have it tested by a local lab. However, the fertilizer recommendations which are returned by the lab may be formulated for commercial agriculture and may recommend excessively high fertilization levels for the home gardener. Use the soil test as a guide to learn where the deficiency lies and the amount of organic content in your soil. Adjust accordingly, but only as necessary. In my experience, (clay soil, MidAtlantic U.S.) your garden needs little more than regular feedings of compost, once each in spring, summer and fall. This may also be amended with mulched grass clippings (without lawn treatments), and shredded tree leaves worked into the top 2 inches of soil. Bagged or liquid garden fertilizers need only to be added in spring, as growth begins and monthly until plants stop growing – never in fall, as nutrients will not be taken up and will wash away with rain and snow. This does not apply to compost, which should be added regularly, as soil bacteria and fungi must act on compost to turn it into the nutrient form that plants can use. Never, ever apply lawn fertilizer to your garden. The high nitrogen levels present in fertilizers meant for grass will “burn” vegetables and cause an imbalance in the nutrient ratio. Bottom line: protect the health of your soil with organic practices and amendments and plants will better be able to utilize the nutrients in the soil. Test for pH yearly, and add compost regularly to maintain and build soil structure and aid microbial activity. The pH of your garden soil – the measure of acidity or alkalinity – directly impacts a plant’s ability to uptake and use nutrients. Soil pH varies from region to region and should be adjusted to between 6.0 – 7.0 for most vegetables. The exception is acid-loving plants like blueberries which thrive in soils as low as 4.5. Only a soil test can tell you what pH your soil is and the test results will recommend which amendments to add to bring your garden soil to neutral. pH extremes lockup the availability of certain nutrients, making them unavailable for plants. Conversely, pH can also make elements so easily available to plants that they actually become toxic (too much of a good thing).